It’s pretty well known that the lapdock accessory for the Motorola Atix wasn’t a success due to an insanely high price tag and mostly buggy software. In fact, Motorola CEO Sanjay Jha in a Q2 earnings call, commented on adjustments to be made going forward with webtop docking accessories now that they better understand their customers. 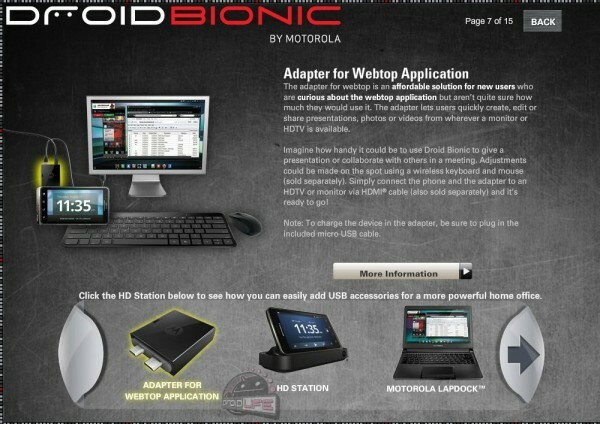 The big question remained though, what would their approach be for the DROID Bionic? We still are not 100% sure what the pricing scheme will be, but we are seeing a new webtop accessory called the Webtop Adapter that will be introduced as a less expensive (“affordable”) option for those that are “curious” about the service. To use it, it’s as simple as plugging the adapter into the Bionic’s HDMI and micro USB port, and then running an HDMI cable from it to a TV or monitor. If you want to charge the device while webtoppin’, there is also a slot for a charger. Not bad, right? 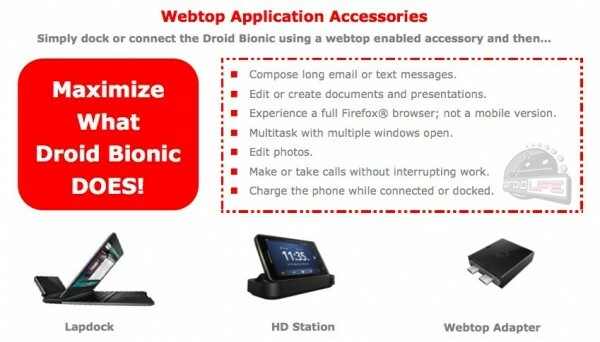 Anyone interested in webtop? The adapter seems like a great option for quick conference room hookups, traveling, etc. The HD Station would be perfect for those that sit at a desk all day and want some extra access to their device. The Lapdock…well…we all own laptops, so I’m not sure who would need this, heh.